It’s all about the gravy on Thanksgiving, and this easy and delicious Southern Homemade Turkey Gravy recipe is foolproof. 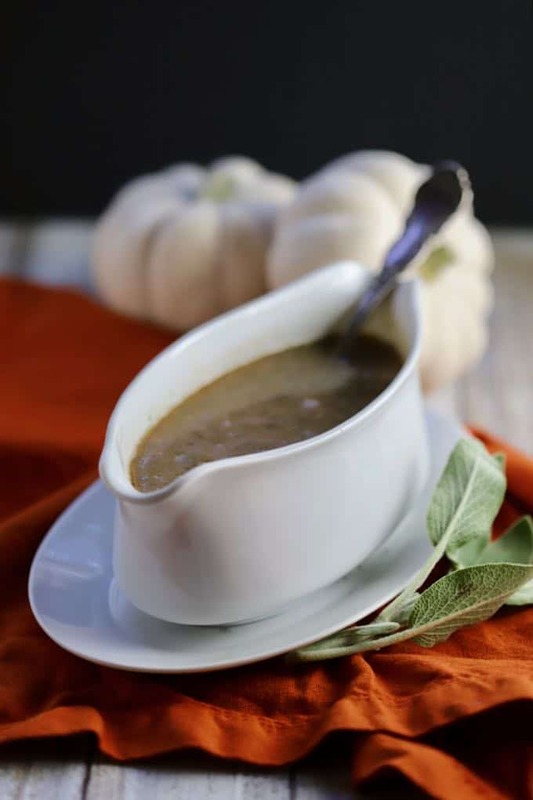 This make-ahead gravy recipe is also a perfect base for giblet gravy, and you can substitute chicken stock for turkey stock to make chicken gravy. 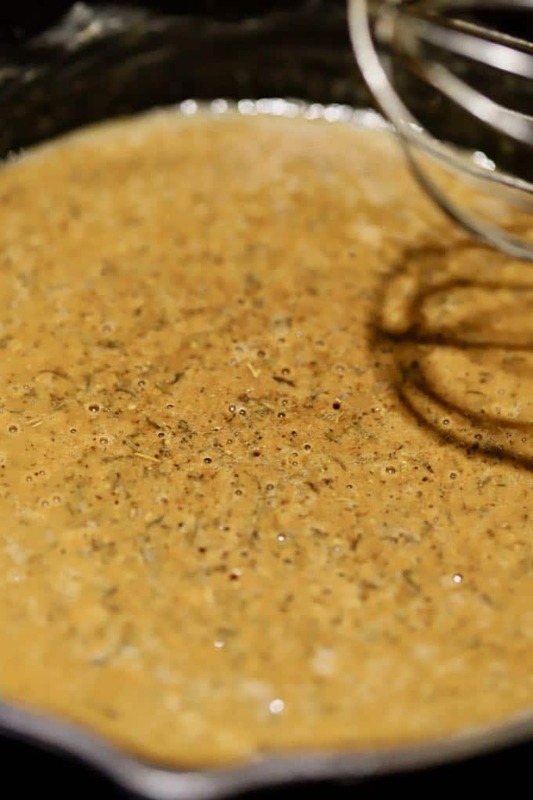 Perfect gravy always starts with a roux. And if you have never made a roux before, don’t let the word scare you. 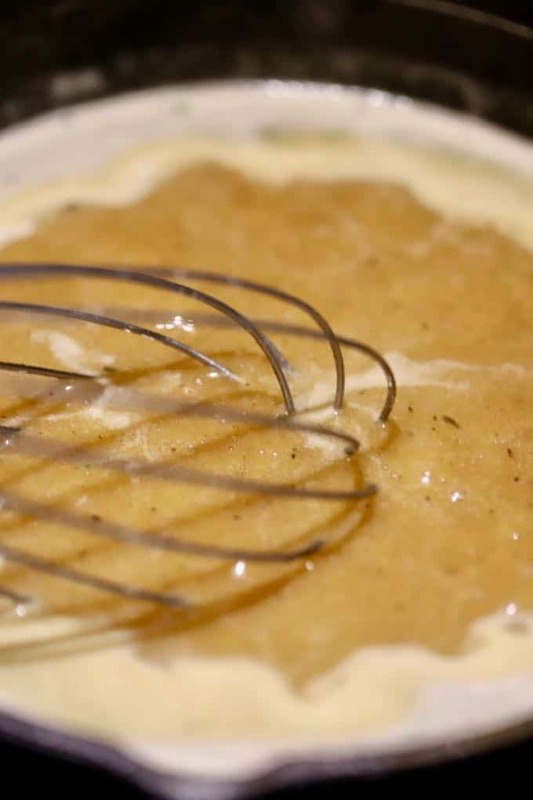 A roux is just equal parts of butter or another fat and flour cooked together. That’s it! 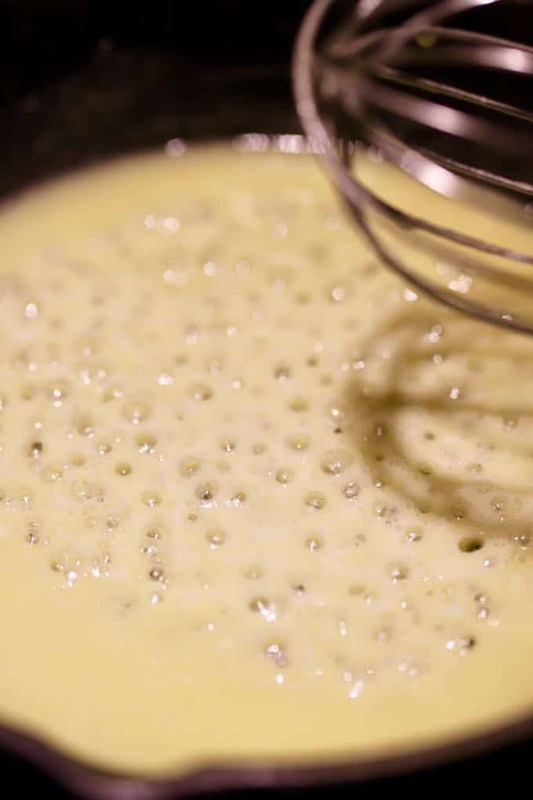 How long you cook the roux determines whether it will become a bechamel or white sauce, gravy, or be used as a thickening agent in soups or gumbo. 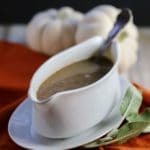 Great turkey gravy also starts with great stock and because it’s Thanksgiving and you are most likely cooking a turkey, I’m also going to show you how to make homemade turkey stock. 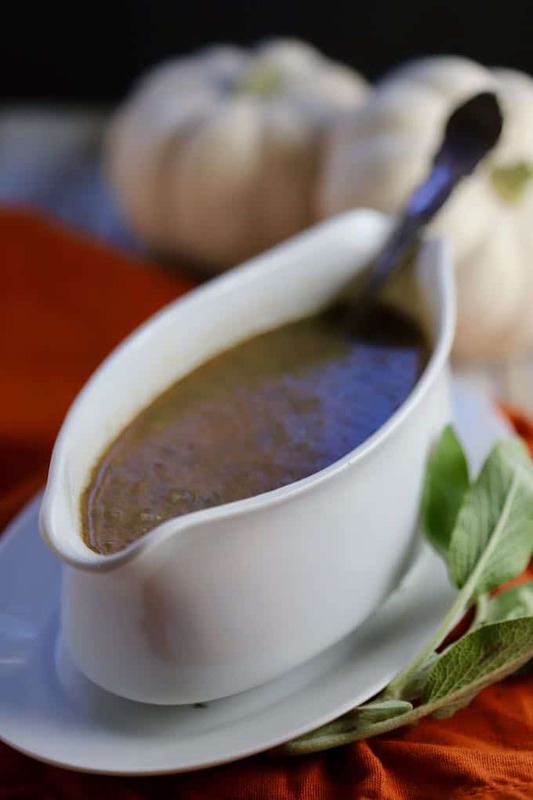 To make Easy Southern Homemade Turkey Gravy you will need turkey stock (homemade or purchased), dried thyme and dried parsley or poultry seasoning, all-purpose flour, unsalted butter and kosher salt and pepper. Melt butter in a small saucepan over medium-low heat. Gradually add the flour whisking constantly. Cook for 5-10 minutes until the mixture has turned a nutty brown color and is just starting to smoke. Gradually add the turkey stock, constantly whisking, and cook for 5 minutes more or until the gravy has thickened. Add pepper. Taste and add a little salt if needed. If making ahead, cover and refrigerate until ready to use. Reheat and serve. *Notes: To make homemade turkey stock, place the turkey neck and giblets in a small saucepan over medium heat. Fill the pan almost to the top with water. 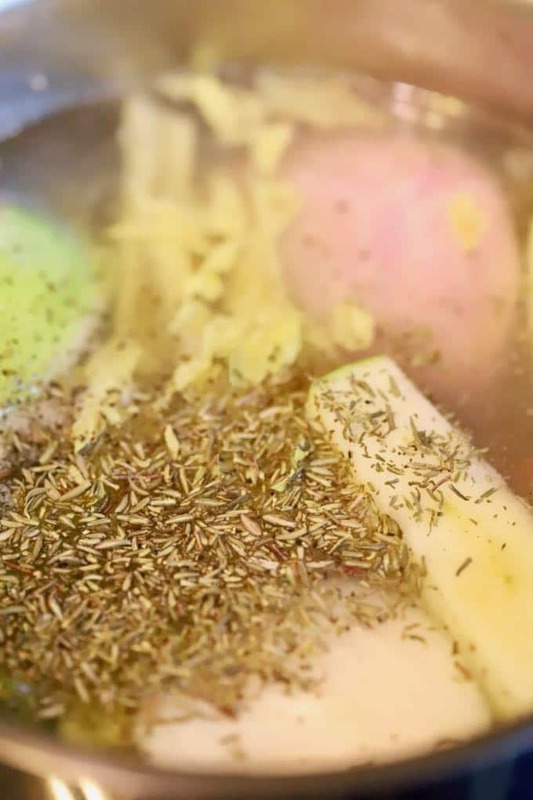 Add half a peeled onion, one celery stalk cut in half, a half of an apple and one tsp of poultry seasoning. When the mixture comes to a boil, reduce the heat to low, cover and simmer for approximately 2 hours. Remove from the heat and pour through a strainer. Reserve the stock to make the gravy. If you are making giblet gravy, chop up the giblets and add to the gravy. 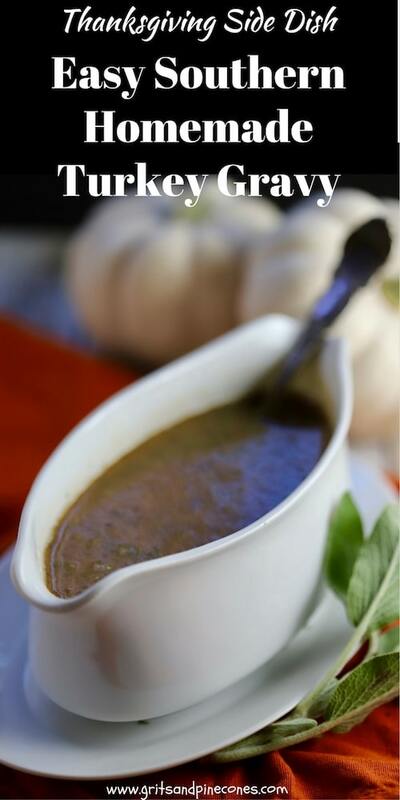 It's all about the gravy on Thanksgiving, and this easy and delicious make-ahead Southern Homemade Turkey Gravy or Giblet Gravy side-dish recipe is foolproof. Cook for 5-10 minutes until the mixture has turned a nutty brown color and is just starting to smoke. Gradually add the turkey stock, constantly whisking, and cook for 5 minutes more or until the gravy has thickened. Add pepper. Taste and add a little salt if needed. *Notes: To make homemade turkey stock, place the turkey neck and giblets in a small saucepan over medium heat. Fill the pan almost to the top with water. Add half a peeled onion, one celery stalk cut in half, and one tsp of poultry seasoning. When the mixture comes to a boil, reduce the heat to low, cover and simmer for approximately 2 hours. Remove from the heat and pour through a strainer. Reserve the stock to make the gravy. If you are making giblet gravy, chop up the giblets and add to the gravy.